I have been in my garden picking my tomatoes and peppers. The tomatoes are just starting to ripen, I have a few little ones, which will go perfect in my salad. However, my peppers are going crazy. I have so many of them growing that I can’t keep up with them. 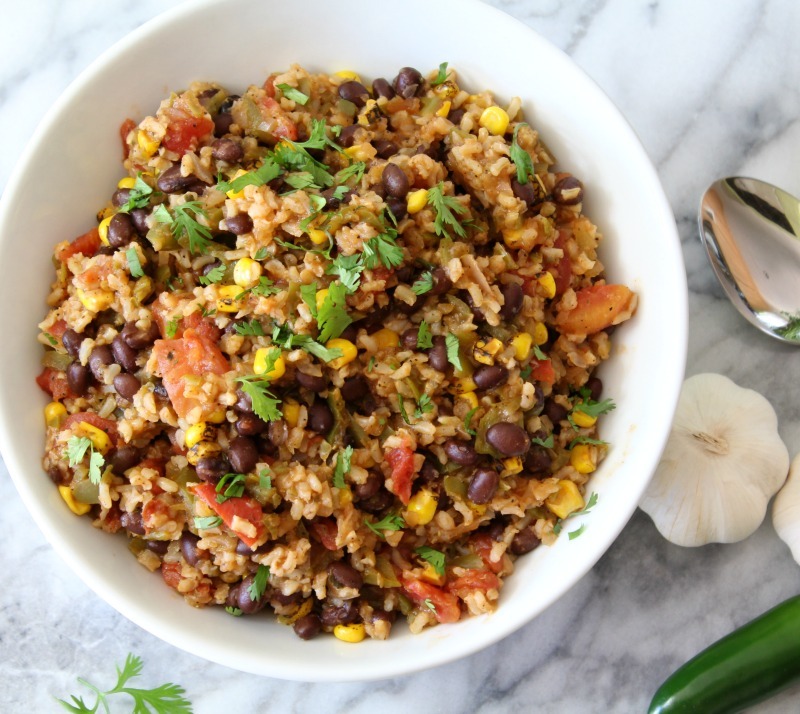 I wasn’t sure what to make with all my peppers, so I decided why not make an awesome rice dish that I can eat for dinner and have for lunches this week. This recipe has it all spicy, flavor and it’s gluten-free and vegan. Perfect for serving any foodie in your family. My Husband actually liked it, which was kind of shocking considering it didn’t have any meat. But hey, how can you not? It’s so good. 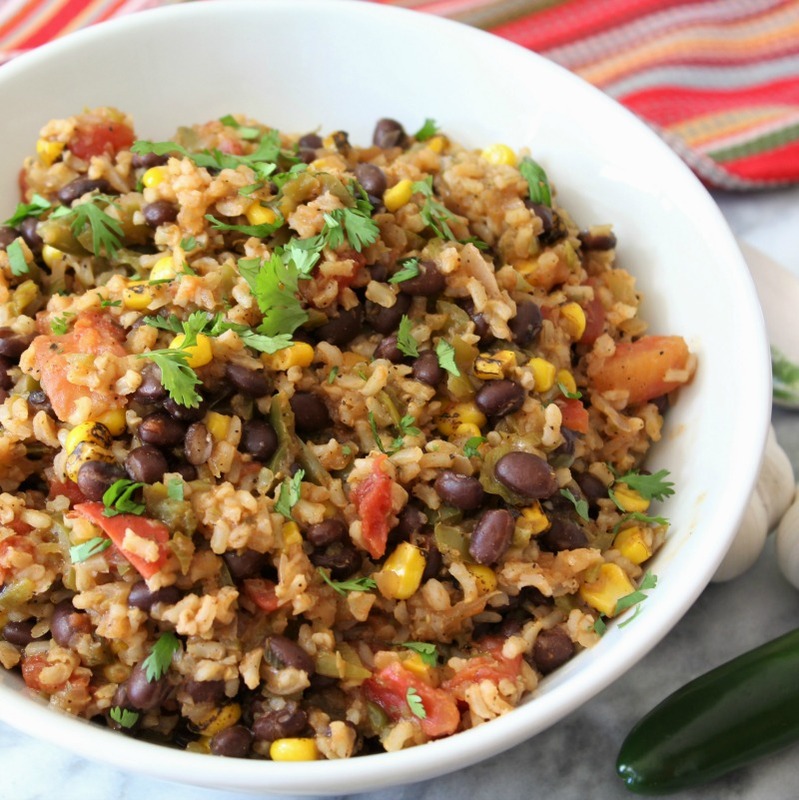 Today’s recipe is Southwestern Rice. This recipe is a breeze to make and it’s about 30 minutes max time. It’s spicy, loaded with flavor and very hearty. It’s great on its own, or adding to a taco or dipping tortilla chips in it. Yum! I got this recipe idea from a spin-off of my stuffed peppers. It’s made pretty much like the filling of stuffed peppers, but hearty and not liquidy at all. Is liquidy and word? Huh, I could stuff peppers with it too. I just thought of that. I may just do that this week, with my poblanos. The recipe is made with Anaheim peppers from my garden, which are tad spicy, but amazing flavor. One of my favorite peppers, next to poblanos and jalapenos. If you like less heat, you can use bell or sweet peppers. Both will be good. I also added onions and garlic to the mix. I used my mini food processor to cut up the peppers and onions. I added them to my skillet with some olive oil and cooked until they were tender, I added tomatoes, brown rice, vegetable broth, cumin, oregano and salt & pepper. Cook for 15 minutes and then add the corn and black beans. That’s pretty much it! So quick. The longest time was prepping. Everything else was a pieces of cake. Here’s a story for you. I cut my peppers, and washed my hands after I was done. I used a paper towel to dry my hands off. I left the paper towel on the counter. The onions, made my eyes burn, so I grabbed my paper towel that I used on the peppers to dry my eyes. HUGE mistake! My face was on fire. Talk about doing something so stupid. Well After a few minutes of leaving water on my eyes, I am all better. I will never do that. I don’t get why onions bother me so much? 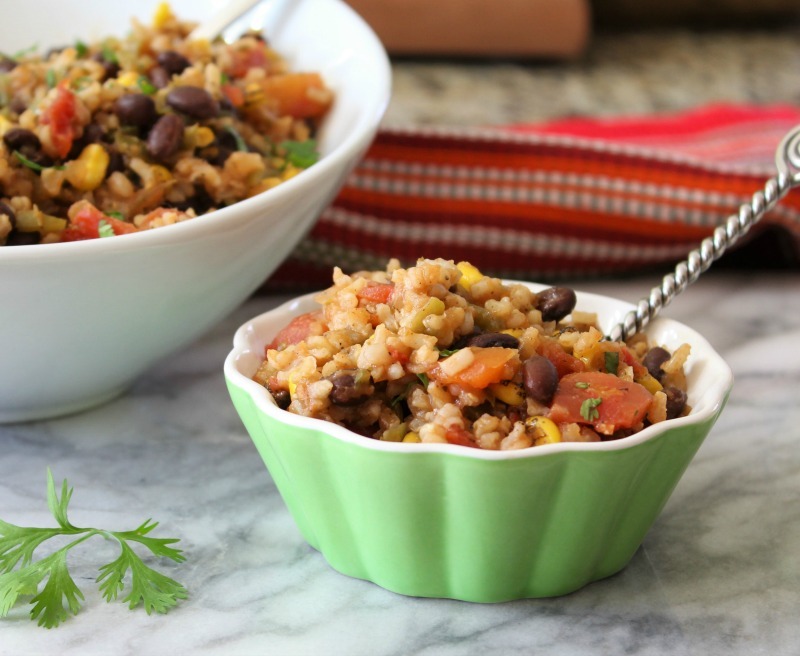 A spicy, quick rice dish made with peppers, corn and black beans, season with spices and herbs. Perfect by its self, on tacos or dip tortillas in it. In a large skillet add olive oil, garlic, peppers, jalapenos and onion. Saute until tender; about 3 minutes. Add can of diced tomatoes, vegetable broth and rice. Stir well. Add cumin. oregano, salt and pepper. Mix until combined. Bring to a boil; lower heat to simmer and cover for 15 minutes. 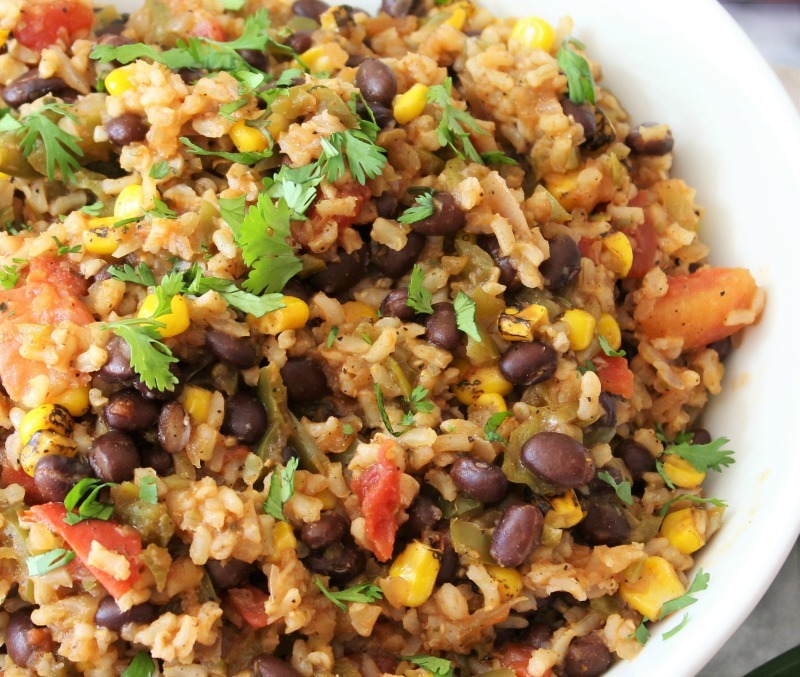 Mix the rice, add black beans and corn, and cook until corn is warmed; about 5 minutes. Garnish with cilantro and serve. You can add bell peppers in place of the Anaheim peppers for less spice. Use gloves to cut peppers and wash your hands thoroughly after touching. I used my mini food processor to cut the peppers, onions and garlic. I love vegetarian dishes like this. It’s so easy and it lasts for a few days in the refrigerator. Perfect for lunches or a quick dinner. Or make a big batch for a Fiesta party. I always tend to forget how much fun I have making rice dishes. I don’t make them to often, but I really should. I am just ticked pink that I have lunches for a few days. Hi Jennifer, this rice looks awesome! I was just looking for a rice recipe to try. So sorry to hear about your onion-pepper incident, very funny though. Thank you! The burrito sounds good. I have been dipping tortilla chips in it. It tastes good cold.